There's something special about birding along a boardwalk . . . .
Perhaps it is because the boardwalk scenario is usually dictated by the presence of water, and you know there would be no access but for the labor of someone who really cared both for the habitat and for your desire to experience it. Maybe it is because the boardwalk's confinement brings a sense of species unseen lurking in the inaccessible parts of that habitat. Personally, I think it is the feeling that the boardwalk allows passage into the heart of the birds' world, on the birds' terms. A world whose intimate workings are usually hidden because we typically bird in fragmented habitats, in short snatches of borrowed time, or in order to put quick ticks on a printed list. Boardwalks slow us down, cocoon us in calm and quiet, and dictate our close attention. Boardwalks are a privilege, their railings a reminder that we are the visiting species here. Boardwalks take us, if only temporarily, to a place we as a species have left behind. And wish we hadn't. Some boardwalks give us quantity, others quality. Several years ago I found myself on a midwestern boardwalk well known for quantity, specifically that of its migrating spring warblers. 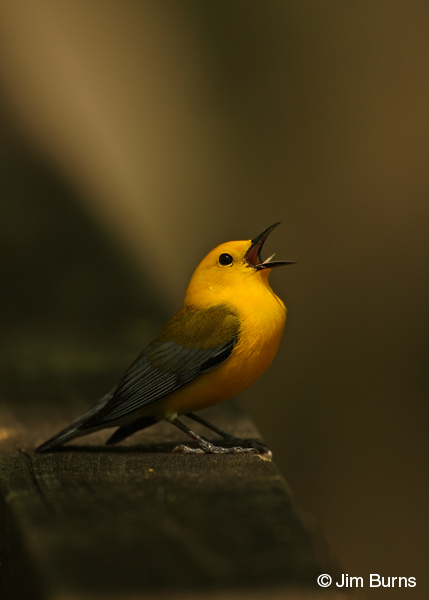 Another birder, a stranger, overheard me lamenting the Prothonotary Warbler which had just flipped off into the marsh having given cursory and unsatisfactory looks. She smiled and said she knew a boardwalk where Prothonotaries were common. I think she may have even uttered the term "trash bird." Imagine Prothonotaries, surely at or near the top of every birder's most-beautiful-warbler list, being so easy to see they've acquired that label! I must admit I'd never heard of the place she told me about--Francis Beidler Forest in South Carolina. Now that I've been there I know she was right. Prothonotaries, in breeding season, everywhere, and so much more. Beidler (BIDE ler) Forest is home to a South Carolina Audubon center. On a map it is located 40 miles west of Charleston, just a few miles north of the I-26 corridor, but on the soul of a visiting birder, especially a first timer, Beidler's imprint will be found only in remote chambers of ancient DNA unopened for untold ages--a primordial wilderness of black water, big trees, and the birds of dreams. The Beidler Forest brochure calls the 1.75 mile boardwalk a "walk back in time." That description is perfect. Beidler Forest preserves over 15,000 acres of bottomland hardwoods and cypress sloughs in the heart of Four Holes Swamp, a tributary of the Edisto River. Eighteen hundred of these acres are old growth cypress and tupelo, one of only two remaining old growth tracts in South Carolina. Here's what "old growth" means at Beidler--most of the bald cypress in this part of Four Holes are 1000 years old, and walking out the back door of the Audubon Center onto the narrow, shadowed boardwalk is akin to entering a cathedral. In the velvet silence and soft light, your mind slips its post modern chains and becomes alert for Ivory-billed Woodpecker and Bachman's Warbler because it knows those birds were actually here, in this place, when the giant trees were but saplings. As the boardwalk begins to wind through hardwoods toward the swamp, your sensory perceptions seem to adapt one at a time to the muted sounds and filtered sunlight. The damp, earthy scent of the sloughs envelops you immediately, but your ears and eyes adapt more slowly. Gradually, especially in springtime, your ears begin to tune in the warbler song--Orange-crowned, Northern Parula, Yellow-throated, Hooded--but they all seem other-worldly as your eyes struggle with the adjustment from dark forest floor to high, backlit treetops. This first part of the Beidler boardwalk through the hardwoods is your best chance to find the elusive Swainson's Warbler, seldom seen well even by those who spend a lot of time in the proper dwarf palmetto habitat here. Learn the rich, ringing, six syllable song. It will be your first clue to this shy, ground-feeding warbler's presence. As hardwoods give way to cypress knees in standing water, your eyes will quickly make their final adjustment to the dark swamp when the first Prothonotary lands ten feet from you on the boardwalk deck and pounces on a caterpillar. Follow along with your binoculars as it leaves and you'll probably see it take its prey to one of the hundreds of potential nest cavities in one of the thousands of cypress knees. Prothonotaries are everywhere at Beidler, seemingly a pair at every turn of the boardwalk, males proclaiming with their "Sweet, sweet, sweet" song, then chasing vigorously through the watery gloaming after perceived territorial interlopers. Just as you become jaded, as if ever you could, with the plethora of "Golden Swamp Warblers," you'll realize that background sound you've been hearing just below the level of your warbler consciousness is, indeed, the spine-tingling stuff of a modern birder's dreams, some by day, some by night. It may be the high, piercing scream of the Red-shouldered Hawk you'll probably never find through the forest fastness. 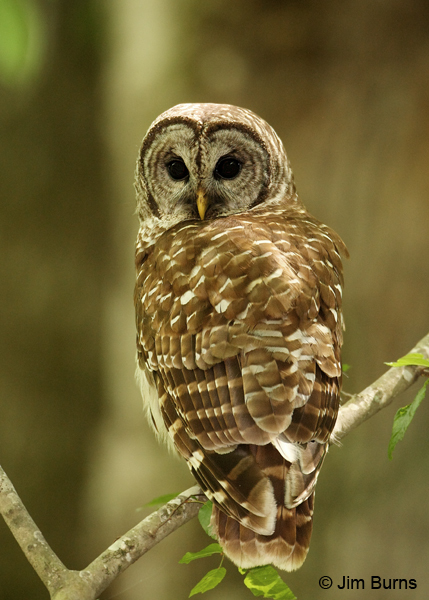 It may be the startlingly deep, riveting hoots of the icon of these southeastern forests, the Barred Owl. Or it may be the raucous wicker and the resonant, percussive drumming of the Pileated Woodpecker, always a visceral reminder of what these forests once held. Although the Beidler Forest birdlist barely tops 150 species, relatively small by some "hotspot" standards, once around its loop boardwalk tells you this one is about quality, not quantity. And once will not be enough. This boardwalk, more than any other you've ever birded, tantalizes with what you didn't see, what you only heard or think you heard, and what you hope emerges from the depths of Four Holes the next time. You may find Carolina Chickadees bringing caterpillars to a nest hole in an oak growing right beside the boardwalk. You may watch a Carolina Wren disappear into a hollow cypress knee at water level only to emerge five long minutes later from a hole at the top. You may finally understand what "opportunistic" really means when a Barred Owl drops to the ground at the edge of a quiet pool and begins extracting worms from the mud. Or perhaps that pair of Pileateds will be excavating the rotting log just off the edge of the boardwalk bench platform. There may be Yellow-crowned Night-Herons or White Ibis in the back channels, or Wood Storks dropping into the lake. Acadian Flycatchers call for "Pizza" under the canopy of cypress and Yellow-billed Cuckoos "Cook" from the tall deciduous trees in the entrance parking lot. Migration brings transients such as Veeries, American Redstarts, both waterthrushes, Rose-breasted and Evening Grosbeaks. Winter visitors include kinglets, thrushes, and sparrows. There is more to Francis Beidler Forest than the birds, and more to the forest than the boardwalk. There are American Alligators, probably the best assurance no one strays from the boardwalk, Opossum, Bobcat, and White-tailed Deer. There are also hiking trails along miles of old logging roads, and a canoe trail for guided forays into the interior of Four Holes. Francis Beidler is the bird sanctuary of dreams, a remnant of what we've lost and the promise of what we can still do. Its boardwalk leads through the dark, mysterious heart of this ancient temple, rewarding the slow and patient birder with some of the most sought species, some beautiful, others cryptic. And with strange sounds and unresolved shadows playing through hazy sunshafts, evoking memories of species gone but not forgotten. You'll be back.